Disclaimer: I received a copy of Spires from the publisher as a review copy. I received no other compensation nor consideration and all opinions are my own unless indicated. A royal family with a penchant for towers has decreed the builders of the kingdom – the players – to perk up the kingdom's skyline with new spires. In answer to their call, players compete to catch the eye of the royal family and ultimately, the title of Royal Builder. Players must be careful though. If they build a spire taller than the royal palace, they'll be penalized instead of praised. Spires combines hand management, a unique take on trick-taking, and set collection into a 25-minute game. 1-4 Players compete for cards in different markets to try to build out their tableaus. Spires is a card game that comes in a "bigger" small box. The box contains 108 cards, 1 good sized wooden marker for the first player and a multi-page glossy rule book. The wooden marker is a bit superfluous and could have simply been a card, but I believe was added as part of the original Kickstarter stretch goals. The cards have a nice linen finish are a of good quality and should hold up to a lot of shuffling and playing. Card art is clean and bright and simpler, though in a good way. The small amount of iconography is also easy to identify and understand. Though there is a solo variant included in the box, I have not tried it, as I feel that that sort of thing is more the kind of $1 app I'd play on my iPad instead of getting out a game and sitting down at the table. I am instead focusing on the standard play of the game which I've played with both three and four-player counts. Each player is dealt a hand of five cards and takes three "selection" cards numbered 1-3. In the center of the play area are three markets (also numbered 1-3). One card is dealt to each market (face-up) for the players to see. Each round, players will secretly select the market from which they wish to compete for the card at that market. When all players have selected, the selections are revealed and the fun begins. If you were the only player that selected the market, you simply take the card and place it face up in front of you. If two or more players selected the same market, they compete for the card by selecting a card from their hand as a bid for the market. 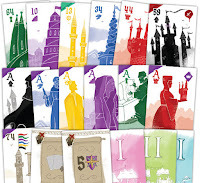 Cards matching the suit of the market card are considered "trump", but otherwise, highest card wins the market AND all the cards bid by the players. All cards acquired are placed face up in front of the players in overlapping stacks sorted by colors, so that everyone can see how many of each color a player has. After all markets have been settled, cards are replaced in the markets and then players refill their hands to 5 cards. This is the only place that the start player marker matters - the refill happens starting with the player to the left of the marker - during the last hand(s), players may end up with fewer than 5 cards. 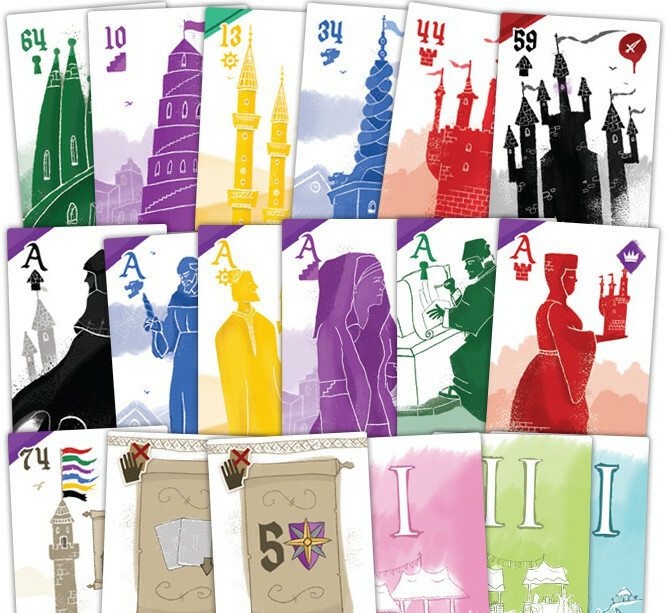 Once all the cards have been acquired from the markets, players must discard a single card from their hand, and then place the remaining cards from their hand into their stacks of cards. For each card in a stack of three or less cards, players get 5 points for each. For any stack with more than three cards, players lose a point for each card. There are also three symbols (crown, leaf, dagger) that appear on some cards - the player(s) with the most of each type of symbol (regardless of the stack that the card is in) gets a number of bonus points and the player with the most points has won the game. Who is this game for / who will like this? While this is a card game, it is not a traditional trick taking kind of game. 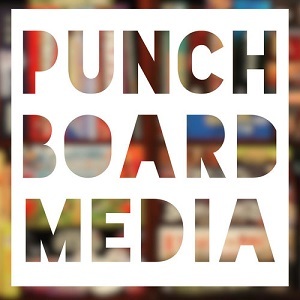 This is a game with a ton of player interaction and if you are the kind of person that enjoys the psychology of Rock-Paper-Scissors, you will love this game. On top of the "guess what everyone else is going to select", there is some tricky hand management and set collection going on. While different from a lot of games, the game is simple enough to quickly pickup for non-gamers and should appeal to gamers and families as well. This is a great filler game to start or end a game night. There is a fine balance with trying to acquire cards (the bonus for the majority symbols often makes taking those cards important) and trying not to acquire too many cards. You are also having to balance that out with the cards in your hand. Holding certain cards can be devastating to your score at the end of the game, but a lot of times, you just don't want to win a market and all the cards that will come with it. In fact, competing at markets is just as often about trying to underplay your opponents instead of winning. When you can foist a card onto your opponent and make their stack of three cards (15 points) into four cards (negative four points) - that's a big swing. There is a lot of trying to figure out what everyone else is trying to do, what they might go for, and then what they might actually play. Add to this a couple of special cards - there are cards that are simply worth points, which you win and just set aside until the end. There are also cards that allow you to discard cards from the ones in front of you. That crap that your buddy just foisted on you? The discard card you win the next round can let you turn that stack of four cards back into a point scoring stack. Its fast and furious and with just enough going on that you have to puzzle out both what you want to do and what others are trying to do. Its one of the best new games I've played in a long time and this is a game I'd run out to buy or easily recommend. It is good with three players and outstanding with four players. My one caveat? I don't think it will work as well with two players. Yes, with two, you reduce the number of markets, but this kind of game plays best when there are more players than markets. With four players, you have a guarantee that two people (minimum) will be contesting a market. This makes a large difference in your approach, because you may not want any of the cards, but know that if you pick one that another player does want, you can dump junk off onto them. This is especially delicious when three or more players choose the same market and only one player really wanted the card there in the first place. Suddenly, nobody wants to gain four or more cards. So there it is - a great filler game for three and outstanding (filler) game for four players. The play is fast, it is easy to pick up, but has great decisions that need to be made each round of the game. Oct 11 Things of No Interest: Review - Fast Food Fear!